Junior Christian Meyer, a Second Team All-University Athletic Association pick, scored three game-winning goals last season. 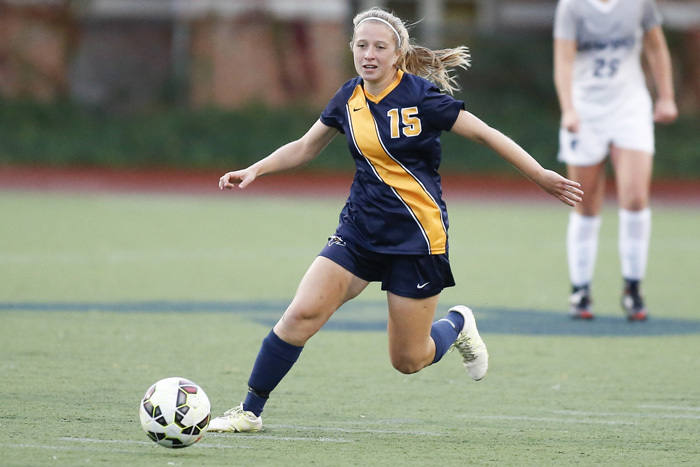 Melissa Ardizzone, one of four juniors bringing experience to the Eagles at midfield, scored Emory's first goal of the season on Sept. 1 as the team dominated Averett University. 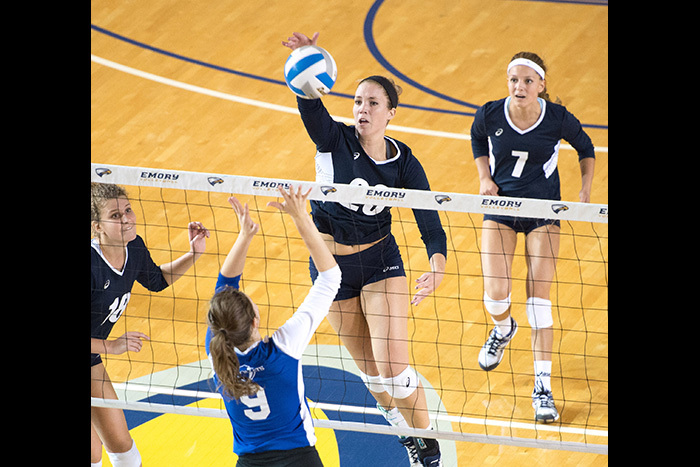 Senior middle Jessica Holler was a dominating presence in Emory volleyball's first match of the 2016 season, pounding out a career-high 19 kills. In women's cross country, senior Sophie Cemaj looks for a big final year after racing to all-region honors in 2015. Fifth-year senior Lukas Mees will be the leader of Emory men's squad after a breakout season in 2015 that saw him rank as the Eagles’ No. 1 finisher in all eight competitions. Emory Athletics is known for fielding strong fall teams and this year should be no exception. As the season gets underway, these five squads promise to provide plenty of excitement for Eagle fans. After registering an overall record of 34-4 last season that included the program’s 20th straight trip to the NCAA Tournament, Emory volleyball prepares for what it hopes will be another successful campaign. Head coach Jenny McDowell returns 12 veterans from a year ago, including senior middle Jessica Holler, who captured First Team All-America honors after pacing all Division III players in hitting percentage (.421). A three-time pick to the All-University Athletic Association First Team, Holler is a formidable defensive presence as well, ranking sixth in the conference in blocks. Senior right side Sarah Maher, along with classmate Kathryn Trinka, will be mainstays in the lineup thanks to their consistency and productivity. Maher stood second on the team in both kills and digs average, en route to garnering Second Team All-UAA accolades, while Trinka emerged as a dynamic offensive force after pounding out a team-best 3.61 kills-per-set average from her outside hitting post. The Eagles opened their season by hosting the Emory Classic tournament over Labor Day weekend, notching a 3-1 record. Sophomore Karissa Dzurik was named by the University Athletic Association as Player of the Week for her performance in the tournament. Emory, ranked No. 6 in this week's AVCA Top 25 Poll, resumes action this Friday and Saturday (Sept. 9-10), competing at Cal Lutheran's Fornia Invitational. The proud owners of 27 consecutive winning seasons, the Emory women’s soccer team should field another solid unit in 2016. Head coach Sue Patberg has a number of returnees at key spots to rely upon and is eager to see what some talented newcomers can add to the cause. Senior defender Hannah Meyer, a First Team All-University Athletic Association selection a year ago, will provide leadership for a young backline. The Eagles promise to be formidable at midfield with the junior quartet of Melinda Altamore, Melissa Ardizzone, Anna Gurney and Bahar Ulusan all claiming starting experience. Altamore knocked in a pair of goals last season en route to Honorable Mention All-UAA recognition while Ardizzone and Gurney also landed honorable-mention nods. Up front, senior Cristina Ramirez figures to be a primary offensive weapon after ranking as the team’s leading scorer with 15 points on five goals and three assists. The Emory team opened the 2016 season last week with three away games in a five-day span, beginning with a 7-0 win against Averett in Charlotte, North Carolina, before heading to Redlands, California, for two games against California Lutheran and University of Redlands on Sunday and Monday. 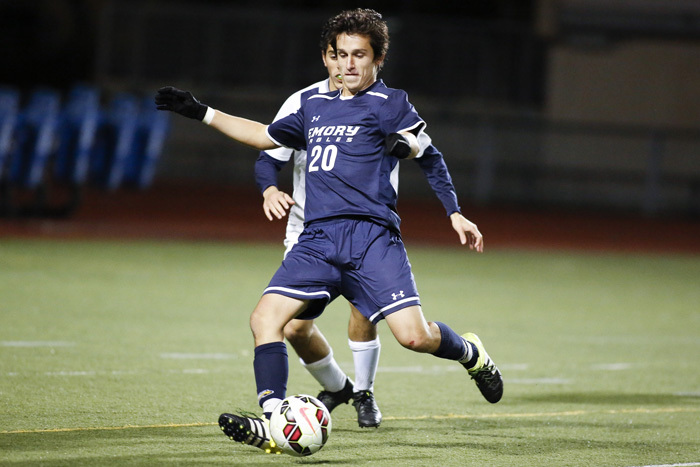 After losing 1-2 to Cal Lutheran, Emory bounced back to shut out Redlands 3-0. The Eagles are in back action next weekend with the Roanoke Invitational at Roanoke College. Emory is scheduled to face No. 16 Lynchburg on Saturday, followed by a date with Roanoke College on Sunday evening. The Emory men's soccer team will look to extend its streak of 15 consecutive winning seasons while striving to earn a postseason berth. Head coach Sonny Travis enters his 10th year at the helm of the program with some key pieces back in the fold from a year ago, including junior Christian Meyer, a Second Team All-University Athletic Association pick whose three game-winning goals were among his team-high tying five markers. Junior Jason McCartney, a Second Team All-UAA choice, and senior co-captain Scott Haley, who has started 27 contests the past two seasons, are proven players who will lead the midfield contingent. Providing a steadying influence among the defenders will be junior co-captain Cody Gardiner, a starter in 14 of 16 contests last year. The team has also added two-time Major League Soccer (MLS) Goalkeeper of the Year and former Jamaican National Team member Donovan Ricketts to the staff as goalkeeper coach. The men's team began its season last weekend by hosting the annual Sonny Carter Invitational. The team lost a tough match to the University of Texas-Tyler to open the tournament, falling 4-5 in double overtime. The Eagles then bested Maryville 2-0 for their first win of the season. Emory retuns to the pitch Saturday, Sept. 10, taking on Methodist University on the campus of North Carolina Wesleyan. Coming off a season that saw it advance to its 11th straight NCAA D-III Championships appearance, the Emory women's cross country team eagerly looks forward 2016. Head coach John Curtin heads into his 31st campaign with a solid group of veterans who will be searching for a third consecutive NCAA South/Southeast Regional title. 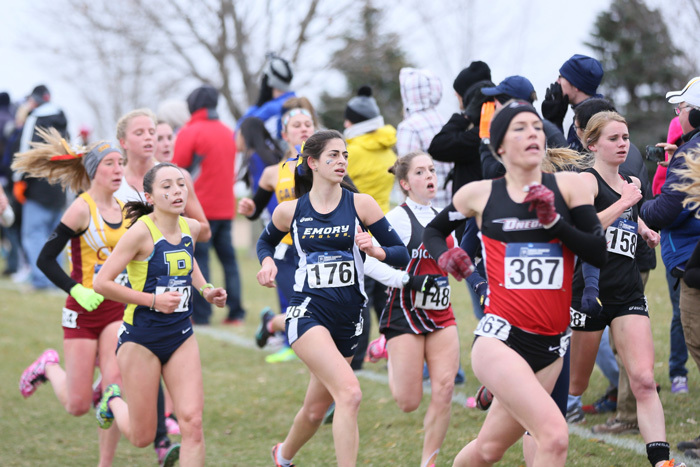 Senior Sophie Cemaj looks for a big final year after racing to all-region honors in 2015. Sophomore Clare Ubersax, another returning all-region performer, aims to build upon a solid rookie season that saw her earn the teams’ Most Outstanding Newcomer Award. In addition, Curtin believes that juniors Megan Waples and Gabrielle Stravach could be in line for productive years. Emory opened its 2016 campaign in dominating fashion Sept. 1 at the Watermelon Run, a 6K race held at the Clara Bowl Course and hosted by Berry College. The No. 21-ranked Eagles registered a first-place finish out of six teams. Emory claimed four of the top five overall finishers, headlined by Stravach, who placed first after covering the course in a time of 23:24. Ubersax was the second Emory runner and third overall, clocking a 24:06. Senior Mia Eisenhandler (24:11) and Waples (24:17) ranked fourth and fifth, respectively. Emory competes again on Saturday at the Furman Classic in Greenville, South Carolina. One of the highlights of the season comes Oct. 29, when Emory's women's and men's cross country teams host the University Athletic Association Cross Country Championships at McIntosh Reserve Park in nearby Whitesburg. The Emory men's cross country team will have a stable of meet-tested runners in its quest to land a third consecutive bid to the NCAA Championships. Fifth-year senior Lukas Mees will be the leader of the squad after a breakout season in 2015 that saw him rank as the Eagles’ No. 1 finisher in all eight competitions. Mees crossed the finish line in the No. 1 spot at the NCAA South/Southeast Championships, the first Emory performer to claim that distinction since 2003, and was chosen by the USTFCCCA as the Region Athlete of the Year. Seniors Michael Sisario and Michael McBane will be key figures in the success of the team. 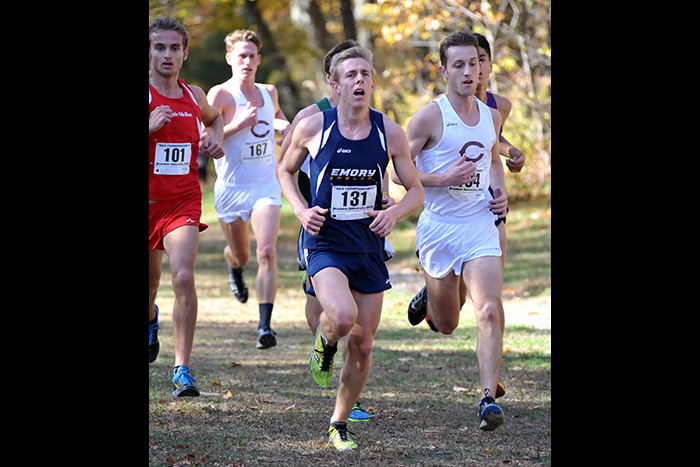 Sisario, who raced to all-region honors, closed out last year with a flourish, placing as the team’s No. 2 runner in his last four meets. McBane, another all-region performer, scored for Emory in six of his eight outings. Sophomore Bennett Shaw, named the program’s Most Outstanding Newcomer, has a bright future after seeing action in all eight events a year ago. The men's cross country team also took top honors at the Watermelon Run, with the No. 32-ranked Eagles placing first in the five-team field for the 8K race. Sophomore Bennett Shaw set the pace for the 66 runners taking part in the event, crossing the finish line in the No. 1 position in a time of 27:04. Freshman Luis Torres was second among the Eagle contingent and third overall with an effort of 27:31 while junior Shane Sullivan's 27:33 ranked fourth. Next up for the team is the Furman Classic this Saturday.